Despite its location in Little India, Leong San is a Chinese Taoist temple. It was established in 1913 by a monk who travelled to Singapore with little more than a statue of the Goddess of Mercy Kuan Im. Chuan Wu heralded from Fujian province in China and upon arriving in Singapore in 1913 he set about setting up a centre for serving the sick with what was initially just a gaggle of huts. Within a little more than a decade, an elaborate temple grew out of these humble beginnings and became known as Leong San. In the 1950s a school was established to cater to the education needs of local kids but within a few years it grew so fast that a new, larger school was set up on an adjacent property. Named the School of Eternal Brightness, it later became a government school and, in 2004, was moved to new premises in Punggol. Despite the school moving away, this remains an active temple and attracts devotees who come to pray that their children will adopt Confucian values such as intelligence and obedience. The temple’s name translates to "Dragon Mountain Temple" and if you look at the roof and gate you’ll see carvings of dancing dragons, winged humans and other fantastic creatures. When you’re taking a look around, be sure to wander through to the rear enclosure -- this is a deceptively large temple. 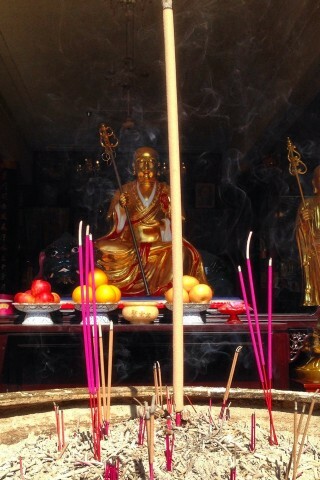 Leong San temple is on Race Course Road and the closest SMRT is Farrer Park. Other nearby attractions that can be conveniently visited on the same wander include the Buddhist Sakya Muni Buddha Gaya Temple, which sits more or less diagonally across the road from here and, a five- to ten-minute walk away, the Hindu Sri Srinivasa Perumal Temple.